Once again, I couldn't get my act together on Sunday and write a weekend update. I blame the weather for my lack of motivation. Remember how I said I wanted a bunch of snow? Well, that wish came true. I guess I should have said I wanted snow in the mountains. We are getting quite a bit of snow in the valley and it is causing havoc on our commutes and makes us have to stay indoors all weekend. Boo. Anyways, we had a pretty good weekend. Pretty relaxing, but we were stuck inside most of it. This next weekend, we have a lot going on, so I always welcome an easy weekend. Friday, we had to work all day due to the holiday. Once we got off work, we headed to the girls school to pick them up. After hanging out at home, we decided to take the girls to dinner and enjoy some happy hour (for Rory and I). We were at the restaurant for quite awhile, so by the time we got home, we relaxed a bit and then started the bedtime routine for the girls. After they went to sleep, we started watching The Deuce again. Saturday morning we took the girls to Holey Schmidt donuts again. This time I got the caramel macchiato donut and a fruity pebbles donut for the next day. Rory got a snickers donut and a minty mint donut for his second day. The girls chose chocolate on chocolate donuts and some milk. They had a pink cake donut the next day. After filling our bellies up with donuts, we headed to Target to get some birthday presents for all the parties we have this upcoming weekend. We wanted to take the girls to the park, but it was 24 degrees and very windy, so we headed home and built a fire instead. 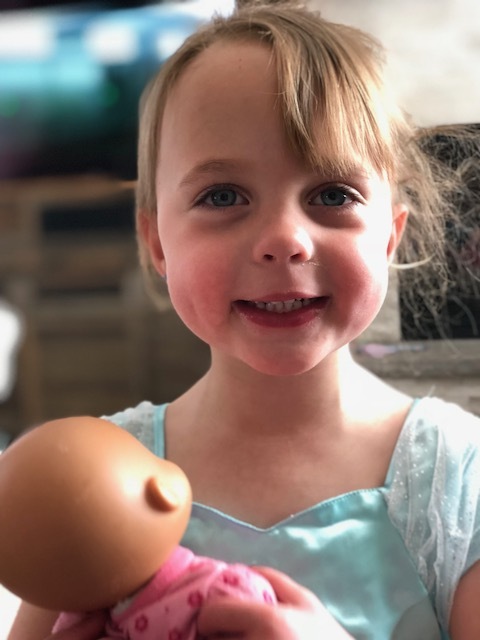 We spent the day relaxing by the fire, giving the girls a bath, watching some Mickey, playing with baby dolls and trying to fight off the crazy toddlers who were aching to get outside. I was supposed to head to happy hour with a friend of mine, but she bailed, so we adjusted our plans. Instead we got some pizza, hung out by the fire and caught up on more of The Deuce. 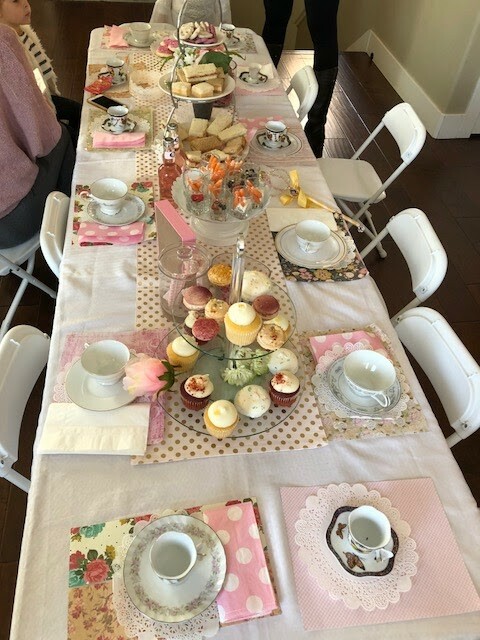 Sunday morning we had a princess tea party to attend. 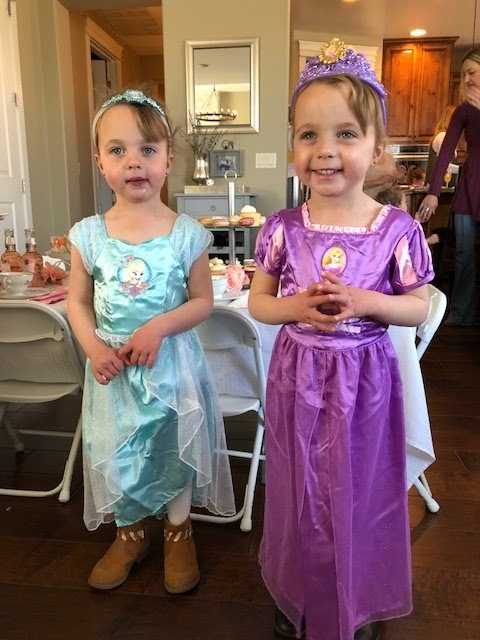 My twin mom friend was having a princess tea party at her house and myself and the girls were invited. 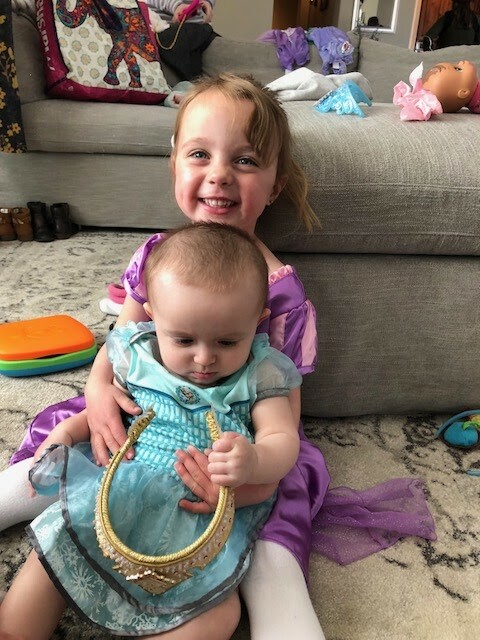 We dressed the girls in one of their princess dresses (the ones with less glitter and were a bit warmer) and headed over. We had an absolute blast. She plans to do this yearly and we can't wait. She had the cutest set up for the table. There was finger sandwiches (peanut butter and jelly and cheddar and turkey), two kinds of cupcakes, french macaroons, carrots and ranch, yogurt with granola and fruit, cookies, cheeses and salami, mini naan and dip, fruit salad, pretzels with another pepper dip and then a variety of drinks including milk, juice, tea, champagne, wine, sparkling cider, water, etc. She played Disney princess music the entire time. The girls dined on yummy food, danced to princess songs and ran around playing. My girls were very interested in my friends daughter who was 7 months old. They had to hold her and feed her her bottle. So cute. They seriously love babies and want one. Ha. As I said, we had a blast and were sad to leave due to the girls nap time. But we have plans for a play date coming up. I took the girls home and put them down for a nap. Too bad Avery woke up early and woke her sister up. Ugh. I cherish nap time and hate that it has only been an hour or so lately. After naps, we watched some of the basketball game that Rory was at. The girls were looking for them, but we didn't see him. Nevada won which means they won their conference, are in the championship and might move up a few spots from #20. Hoping for a nice seed in March Madness. Rory came home and took the girls on their scooters (even though it was only about 45 degrees) while I went grocery shopping. I came home and painted the girls nails and then made dinner. We all had salad and stuffed shells. After dinner, I cleaned up and then we watched some more basketball and then got ready for the bedtime routine. After the girls were in bed, we settled in for the Women Tell All and then headed to bed right after. I love a quiet weekend from time to time! 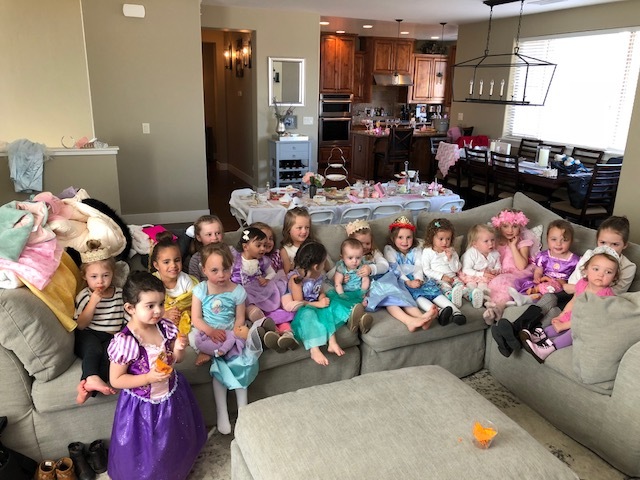 That princess party looked adorable! 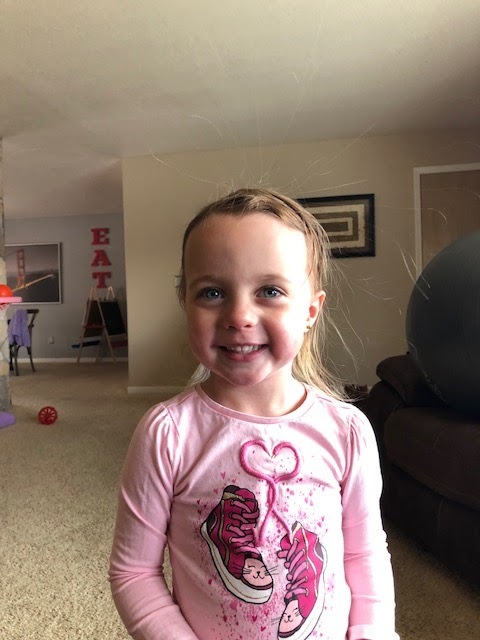 Try a leave in condition for the girls staticky hair! I do for #babybigtruck. Works wonders! That princess tea party looked so sweet! Any weekend with doughnuts is a good one for me, lol. Have a great start to your week. It was soooo sweet and so much fun. I love a good donut and these ones are amazing. 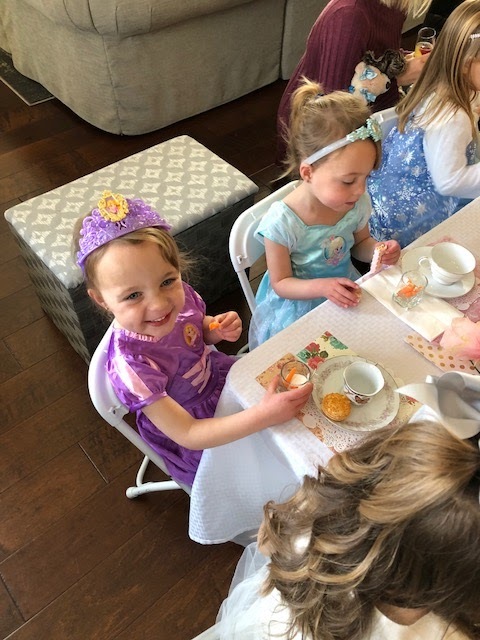 A princess tea party sounds like a lot of fun! That princess tea party is so adorable! I want to throw one for my nieces! A caramel macchiato donut sounds like heaven! Hope you are having a nice day! How cute! E is meh on princesses. I wish she were a tad more girly, but oh well, she is who she is. 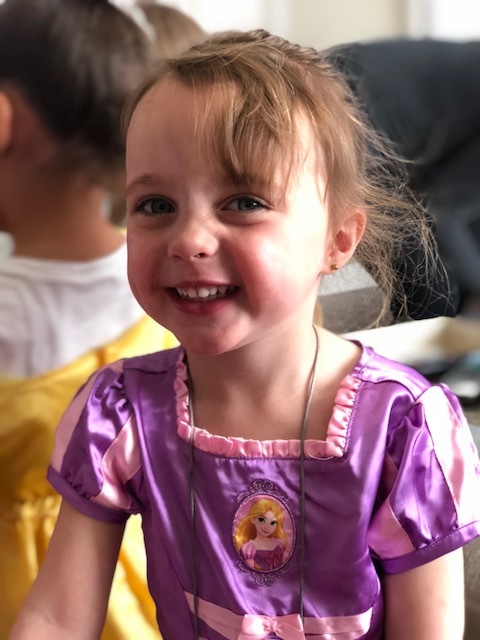 I seriously am still gushing over the princess tea party!!! The girls look so cute with that baby :) I cherish nap time too and when it is cut short, I myself want to cry haha. Hope you have a great week! Those smiles. How cute is that table setting & all those little princesses. Oh those little princesses look so cute!! Sounds like it was a great weekend. Love the name of the donut store! SO fun. That tea party looks like such a great time!!! :) And oh my , those donuts! They sound amazing. That princess tea party sounds like so much fun!! What a great idea. And that picture of all of the babies piled on the couch is just adorable! Sounds like a good weekend! 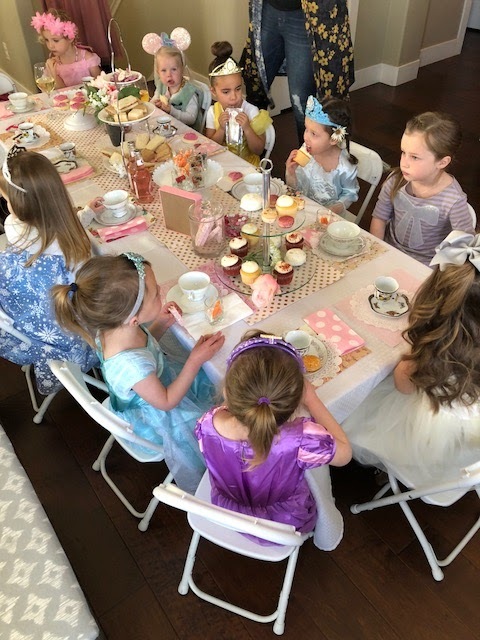 That tea party is the cutest, I bet the girls were in heaven. And yummm stuffed shells - I need to make those sometime, it's one of my favorite meals. 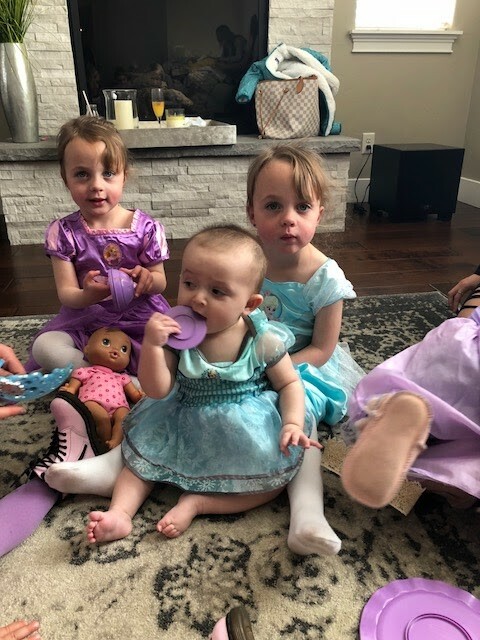 That princess party is cuteness overload! !